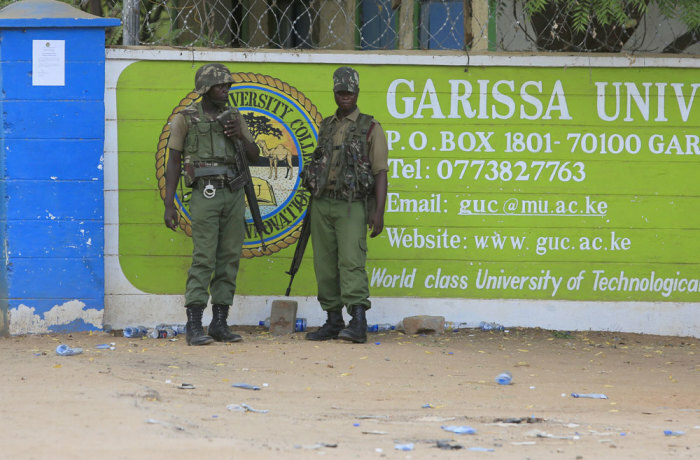 Kenya's government is facing increasing criticism for failing to read warning signs and for a systematic state failure that led to the massacre at Garissa University College in Kenya, where 148 people, mostly Christian students, were murdered last week. The security officers who shot down the four terrorists carrying out the killings, have, meanwhile, expressed dissatisfaction at the lack of pay, and have reportedly recieved so far only the equivelent of $5 USD. "There is no sure-fire prevention against terrorist attacks," Horn of Africa analyst Abdullahi Boru Halakhe, an academic and expert on the region, told AFP. "But the scale of the Garissa attack, the prior warning and the regularity with which these attacks have been occurring, points to systemic state failure – and the buck stops with the president." Christians in Kenya and around the world have been mourning the terror attack, where the gunmen separated Christian from Muslim students, before murdering the Christians. Terror group al-Shabaab has taken responsibility for the attack, and has warned that more is to come. "No amount of precaution or safety measures will be able to guarantee your safety, thwart another attack or prevent another bloodbath from occurring in your cities," the group warned. While government forces have launched air strikes on al-Shabaab bases in neighboring Somalia, other experts, such as journalist Mohammed Adow, a Kenyan and an ethnic Somali who has worked with Al-Jazeera, have blamed the poor living conditions in Kenya for driving some to join the terror group. "As a result of decades of marginalization, northeastern Kenya – as well as parts of the coastal region – lacks basic services such as paved roads, schools and hospitals," Adow said following the attack. "Resentment towards the government is high and radicals are able to exploit these factors. Chronic youth unemployment, for example, makes Al-Shebab's (sic) promise of some income attractive." Jambo News reported that the General Service Unit's Recce Squad, the security officers who shot down the gunmen 10 hours after the attack began, have also expressed frustration, because they have not been paid their allowances. The officers reportedly each received only Sh500, or U.S. $5, as lunch allowance, but have not been paid the expected Sh3,000, or U.S. $32, because that is only given when they spend a night out on duty. Officers have said that they are lacking in job motivation, with the pay not corresponding to the danger the job entails. Kenyan authorities have also been accused of taking hours to respond to the massacre despite an alarm being sounded, and a police source told CNN that they arrived at the scene in Garissa even after politicians and journalists. Manoa Esipisu, a spokesman for Kenya's president and deputy president, defended the response time, however. "With the benefit of hindsight you can always say things could have been done better," Esipisu said, and argued that Kenyan authorities saved a lot of students and "got the job done." Kenyan President Uhuru Kenyatta has also vowed that his administration will "respond in the severest ways possible" to the slaughter, and will "fight terrorism to the end." The murdered students were remembered in Easter Sunday messages by Christian leaders around the world. "May constant prayer rise up from all people of goodwill for those who lost their lives – I think in particular of the young people who were killed last Thursday at Garissa University College in Kenya – for all who have been kidnapped, and for those forced to abandon their homes and their dear ones," the pope said.